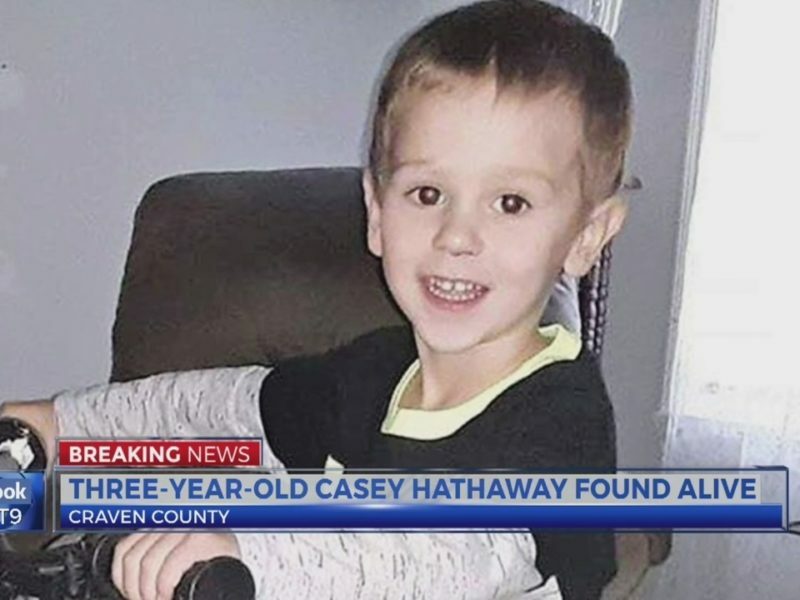 3 year-old Casey Hathaway was missing for three days in Craven County, North Carolina. Craven County ministries and churches held prayer vigils for him and God answered their prayers! Fox News is reporting it, “a miracle find.” They say, “He was found tangled in shrubs amid freezing temperatures.” He was about 50 yards away from a road and a quarter mile away from where he was last seen on Tuesday. Casey was playing with two other kids outdoors this last Tuesday but didn’t go into his grandmother’s house after playing. Authorities were notified within an hour of him missing. Shane Grier, a captain for emergency medical services, said, “We resounded to a tip and found him by voice. We disentangled him from some briars and brought him out. He was cold, he was verbal. Considering the conditions, I think he is doing very well.” It is said that Shane was the one that found Casey upon hearing the child calling for his mom. People all across America are thanking God today for Casey’s safety. When I was listening to Christian radio this morning, people calling in were celebrating the miraculous find. And Mercy Me’s song, “Good News is the Best News Ever,” started playing. A praise that God was watching over Casey Hathaway. Father God, thank You for watching over Casey Hathaway. Thank You so much that You answer prayers. And we thank You for good news. And may Your healing hand be upon Casey and may he fully recover, growing in You. In Jesus Name, Amen.